Can't be damaged or targeted by Cliff Racers, Cliff Hunters, and Cliff Striders. 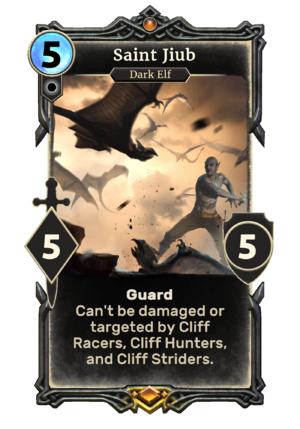 Saint Jiub is a unique legendary Neutral creature card. It is the changed form of Jiub. "Saint Jiub, Eradicator of the Winged Menace, at your service." The complete name is displayed in a tooltip: Saint Jiub, Eradicator of the Winged Menace, sometimes known as Jiub the Magnificent. Saint Jiub is mentioned in Oblivion as the mysterious hero who somehow drove all the Cliff Racers from Vvardenfell. This page was last modified on 2 March 2019, at 00:48.